Discussion in 'iMac' started by Mekintoch, Apr 10, 2013. I've an Imac 24" alluminum of 2008 with some problems. in the meanwhile I can listen the HDD it's working ...ccrrc crccr rc ccr... then the wheel stops and nothing happens... dead. I press the power button 1 time, and it shut down immediately, and if I press again, turns on, but no image on screen (all black) and for half a second the fan spins fast then nothing. But, if I disconnect the power cable for some seconds, and I try, starts like before (white screen and blocked after about 40sec.). In an Apple store they make a check, and said it need a new Logic Baord (all operation cost 900... toooooo much), I hope somebody here can help me doing some tests to be sure it's the Logic Board, so I can buy it and change it by my self. I've open it up for dust inspection etc.. there is something I can check?? I had a similar issue with my 2008 Aluminum iMac. I was VERY fortunate that it appeared to be a corrupted directory that Disk Warrior was able to fix. I booted from the Disk Warrior disc, ran the Repair Directory function and rebooted and all was well. This was almost 3 years ago and haven't had a problem since. It's also possible that it could be a bad block on the hard drive, but if you have Disk Warrior, or any other diagnostic software (TechTool Pro, etc.) that's where I would start first. I'll check if I can find a Disk warrior somewhere here, or do you know if it's the same if I make a Disk-Warrior bootable USB flash drive? As long as you have a version of DiskWarrior that supports bootable flash drives, there should be no difference - to my knowledge at least. Also, with the age of our iMacs, if you haven't already, I would definitely make sure you have an up-to-date backup of all of your files, preferably a bootable clone. That way if you need / choose to replace the hard drive, you can just restore from the clone and have everything back to the way it is now. The average hard drive is only rated for 3-5 years so after this happened to me I became very dedicated to backing up. I use SuperDuper! for making a bootable clone of my entire iMac hard drive onto an external USB drive. I've found a Diskwarrior 4.1, and I made a bootable USB with Transmac from windows 7. On the Imac I press Option button at boot, and I see the Diskwarrior USB, I press enter on it, and after 10sec of USB reading the Imac reboots, and nothing changed, same problem. I will try another version of Diskwarrior from a friend tomorrow, will see. There is a way from windows 7 to check errors or fix the HDD of the mac if I connect it like by external hdd? have you or did apple run a apple hardware test? I have that same model and it died a couple of months ago. It would go into a reboot loop and was totally unresponsive. I opened it up and checked the diagnostic led's and only the first one was lighting up. It turned out that it was the power supply. I could see that there was an over heated component on the reverse side of it. I purchased a new PS, installed it and that fixed it. The Basic Test passed, all OK! Now I'm in "Perform extended testing", I late you know soon. This morning I've tryed other 2 versions of Diskwarrior that a store borrow me, and both are not working... when I select them, starts reading...and reading, then come out the same apple screen with the spinning wheel like I on first post, and get stuck .....seems like he don't like the diskwarriors and it jumps directly to the normal boot. Mine will not reboot automatically, but get stuck with the charging spinning wheel after 30-40sec. Ok, the Extended Hardware Testing has passed, all OK? (after 1 hour and 13minutes). -- With just the power cord in, 1st Led it's on, the other 3 are off. -- When I press the Power Button, 2nd Led lit ON, then when I listen the "DONG" sound 3 & 4 lit ON (all 4 Leds are ON). -- When it get stuck (Apple logo and spinning wheel stuck), I press the power button and it goes OFF immediately, but now the 1st & 2nd Leds remains ON (3 & 4 are OFF), what's wrong? -- If now I turn it ON, the 3rd led comes ON but the 4th remains OFF, the screen remains black, and the fans are spinning fast for half second. (all the same symptoms I described in first post). -- If I unplug the Power cord for some seconds, and back on, all restarts from first point. Other test that I can make? strange that apple hardware test didnt pick up that it was the logic board if thats what it is. 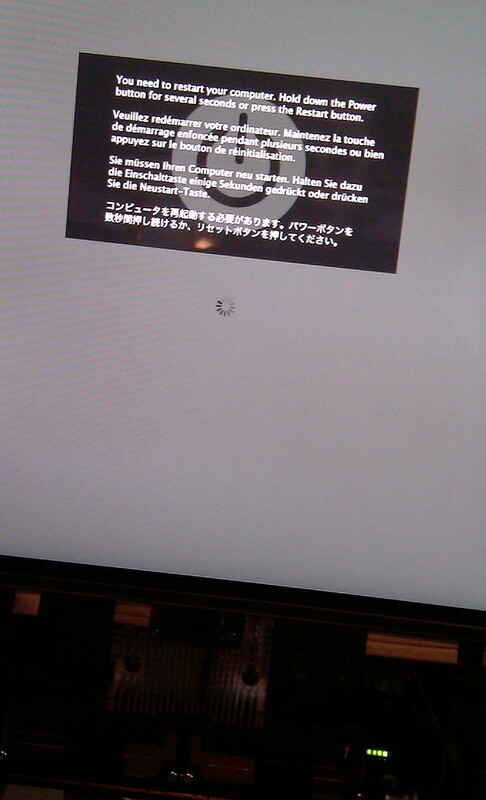 what good is apple hardware test otherwise. I just have to decide if trust in Apple inspection and buy a new Logic Board, that I've found for 300, or go on with other test to see if there's something else that makes problems. (I've only some doubt about the Apple guy that seems he like to charge more damage than real ....maybe saying truth). If you guys have other suggestion, please please please , let me know soon, I need to decide tomorrow. Nobody here have any suggestion? Today I mount another HDD and try to install OS from Disk1. I'll try with another HDD soon. I have a 2008 iMac 24" and had the same symptoms a couple of years ago. I noticed that opening apps and moving between windows suddenly become very slow and in the space of about 2 days, it started to go to a crawl. On reboot, grey screen... after about 10 reboots in a row it finally came back on but took about 20 minutes to boot and everything was REALLY slow. Tried a few things and every reboot too more attempts and longer to start. Replaced HDD with 2Tb Raptor and used Time Machine to restore. It flew and all back to normal again. In love with my Mac again and all great. A spinning wheel will almost always be the HDD, or a corrupt partition on the drive. 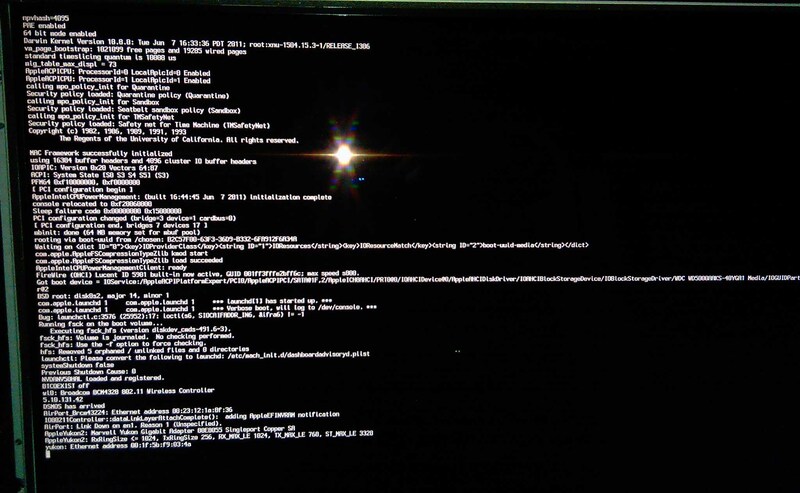 Boot it into verbose mode and show us a photo of it when it's frozen. Any money it says something like "Invalid B-Tree". I upgrade my computer every 3 years or less, I could never be with one without warranty. It's too late for this now, and you probably have already spent a considerable amount of money for a new logic board, but…. … if you had maintained a BOOTABLE EXTERNAL BACKUP DRIVE, you could have tried booting from the alternative drive as your first attempt to get running again. Instead of having all the problems that you're experiencing now. Yes, big error... but making different tests, hardaware test, diskwarriors etc.. plus the most important suggestion in mind that an Apple technician put it's hands on it and gives me an estimation of work and precisely write on paper that the LogicB needs to be changed. (Estimation cost'd me 50€, repair cost 900€..................a lot). Ouch - I really feel for you. Please, please tell me that you had the mobo change done by the service provider. I don't blame you if you didn't, as I would have thought 'screw this!' and tried it myself if it had saved a chunk of money. It's just if they gave you the advice, and then it didn't make a bit of difference, you must have some sort of comeback with them to get at least some of your money back. As others have said, if the computer is 5 years old and crapping out on you, it is time to get a new computer. The current base 21.5" isn't much more than the repair quote that you had, and apart from a slightly smaller screen, will destroy the old computer on everything. 5 years, I can understand, but I have to save money and anyway it's an Imac used just for internet and for some photoshop works, I think it's good even for other 5 years. Screen looks good, DVD working good, and forgot to say that I've test today the HDD on HDTune Pro, perfect, no errors. After another simple research about the last proscess in Verbose mode (Yukon: Ethernet......), I found this Thread here that seems to give me the answer. How to check the GPU without having another one? Someone just pointed me to this thread who has the same problem. Have you tried booting in safe mode sometimes this will work? PM me of you need any more help. """I've just tryed to install all from zero on the actual HDD, same screen with spinning wheel for more than a minute with the DVD player reading... then spin.wheel stuck, and a grey "curtain" coming down slowly from the top and a message that suggest to "Hold down the Power button for several seconds...."""
So this time I mounted the Win7 Dvd, and install it on the 80GB HDD, all worked perfectly except on a presentation screen (just before the partitioning/format window) where you see the Windows logo in the middle coming ON, and says "Starting Windows", here I saw a lot of noise, full of small blue lines flashing on the black background. Other then this it reboots 2 times (normally I remember just one time, right?). In windows, I set the resolution to 1920x1080, working OK, but on the GPU properties something not correct: it's only typed Nvidia, 8bit, VGA, memory 14MB. So I tryed to stress the GPU, opened windows media center, and a message advise some application may not work properly cause of low VGA memory. Then same message on game, Chess Titan, and no 3D. Maybe I need to install the right drivers, or this it's enough to confirm a GPU prob.? S3man, 've tryed booting in safe mode and nothing happens... will try again and more times in a few hours. The wheel always stops, and nothing happens. I make directly the Nvidia setup inside, and it succesfully complete and reboot automatically, but then, nothing changed, only that on GPU properties it's all unknown. Tryed to reinstall again, some 32 error... so I've tryed manually selecting the .inf file from the nvidia x64 folder, succesfully installed, reboot, and nothing changed. Please, somebody tell me if I've to try something else before spend again money in the wrong way.